(1) Boota, M.; Anasori, B.; Voigt, C.; Zhao, M.-Q. ; Barsoum, M. W.; Gogotsi, Y. Pseudocapacitive Electrodes Produced by Oxidant-Free Polymerization of Pyrrole between the Layers of 2D Titanium Carbide (MXene). Adv. Mater. 2015, 28 (7), 1517–1522. (2) Hatzell, K. B.; Boota, M.; Gogotsi, Y. Materials for Suspension (Semi-Solid) Electrodes for Energy and Water Technologies. Chem. Soc. Rev. 2015, 44, 8664–8687. (3) Boota, M.; Hatzell, K. B.; Kumbur, E. C.; Gogotsi, Y. Towards High Energy Density Pseudocapacitive Flowable Electrodes via Incorporation of Hydroquinone. ChemSusChem 2015, 8 (5), 835–843. 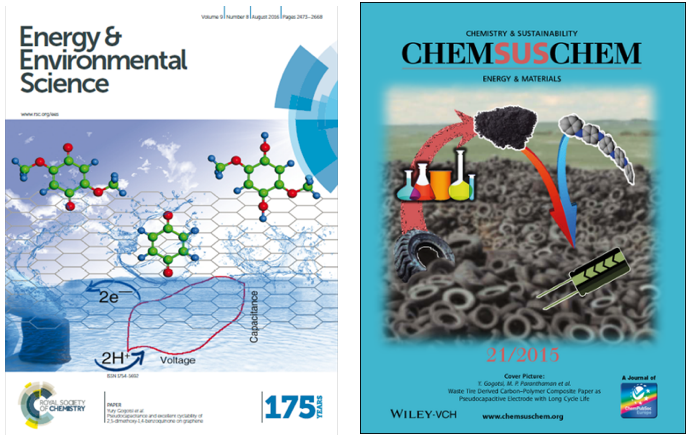 (4) Boota, M.; Chen, C.; Bécuwe, M.; Miao, L.; Gogotsi, Y. Pseudocapacitance and Excellent Cyclability of 2,5-Dimethoxy-1,4-Benzoquinone on Graphene. Energy Environ. Sci. 2016, 9, 2586–2594. (5) Boota, M.; Paranthaman, M. P.; Naskar, A. K.; Li, Y.; Akato, K.; Gogotsi, Y. Waste Tire Derived Carbon-Polymer Composite Paper as Pseudocapacitive Electrode with Long Cycle Life. ChemSusChem 2015, 8 (15), 3576–3581.